WHETHER COMPETITIVE OR SOCIAL, TENNIS IS A YEAR-ROUND PASSION ON OUR STATE OF THE ART FACILITIES. Whether competitive or social, tennis is a year-round passion on our state-of-the-art courts. 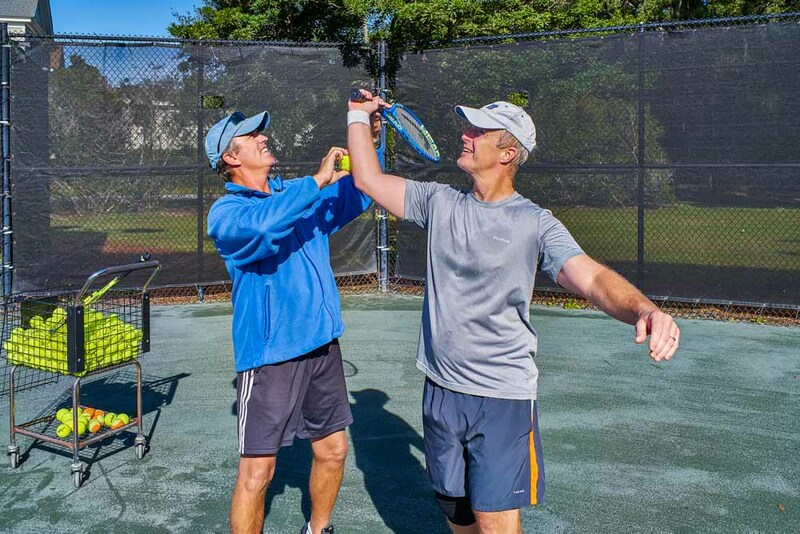 Our tennis facilities provide a relaxing atmosphere for your family and guests, and yet another way to enjoy the Lowcountry’s amazing year-round climate. Our service oriented USPTR certified staff offers private and group lessons on a weekly and annual schedule on our 6 Har-Tru clay courts. We also offer same day professional racquet stringing. Diverse tennis programs and events for players of all ages are offered, such as Margarita Mixers, cardio tennis, Member-guest tournaments and daily clinics. For the younger players, children eight and under enjoy the quick start tennis program. The Sports Club offers diverse tennis programs and events for players of all ages, such as margarita mixers, cardio tennis, member-guest and club championships. For the younger players, children eight and under enjoy the quick-start tennis program, as well as The Sports Club’s popular annual parent-child tournament.